Almost anyone who has a little desire, some common sense, and a week to spare can study for and pass the Home Inspectors exam/s. Better credentials mean more knowledge and more protection for the home buyer. So if almost anyone can get a license to become a Home Inspector, what other credentials will help me choose the right Home Inspector? Certified Master Inspector® is one of the best credentials to look for in a Home Inspector. A background in construction is helpful. A State UDC Building Inspector credential helps too. Even though codes are not typically part of a home inspection, knowing the codes will help minimize your financial exposure if the current home had some of the remodeling done by an under qualified handyman. An Expert Witness will know many reasons that past home buyers regretted saving money on a cheap home inspector. An Expert Witness can testify as to the quality of workmanship when substandard contractors work on a home you plan on buying. It’s wise to have an experienced inspector evaluate your potential home so you are not just falling in love with the cosmetics of the house. An expert witness knows many of the reasons home buyers were not happy with their last home inspector. Problems go with the house to the home buyer. It can be difficult to go after the seller if you discover problems after you move in. Even if you were to win a legal judgment against the seller, an attorney would typically take a significant percentage of your award. Why is being a member of WAFRP so important? The WI Association of Foundation Repair Professionals – WAFRP (www.wafrp.com), specifically, their engineer, wrote the guidelines for foundation repair that is now part of the WI Building Codes. Since a home inspection is to detect observable conditions, your average home inspector may not take measurements of the foundation wall movement or does not adequately know how to interpret the results of the measurements. You do not want to buy a home and find out after you move in that the foundation wall/s had problems before you bought it. Foundation repairs are typically the most costly home repairs you will encounter. Minimize your risk of future problems by hiring an inspector that knows foundations. What’s the advantage of hiring an inspector who brings a Thermal Imaging camera to the inspection? If you have in-floor or in-ceiling heat, if you have cathedral ceilings, if you have paneling on the basement walls, Infra-Red (IR) images will often tell you if your heat runs are missing or damaged, if your ceilings or walls have voids in the insulation and sometimes if there are signs of moisture behind basement wall covering. Is Radon a problem in my new neighborhood? Here’s the link to the WI Dept of Health Radon Website by Zip Code. Can’t I just test for Radon myself after I move in? You certainly can. Though… if you have a Certified Radon Measurement Provider test and discover that the house has high levels of Radon before you buy it, you may be able get a credit for the cost of installing a mitigation system. Donn inspected the home we are purchasing and I walked away from the experience fully aware of the condition of the property. His experience and knowledge were obvious and we feel confident from his inspection to move forward with the purchase. I highly recommend using Anderson Home Inspection for your home inspection needs. Donn Anderson has inspected two homes for me now. 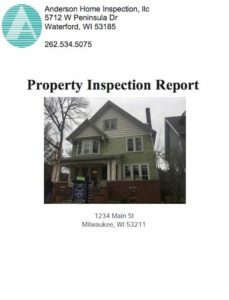 Both times Donn has pointed out things that I missed on my own viewings of the properties and I used his report to get concessions from the seller in both cases. Donn was AMAZING!! We just purchased our first home and Donn was great with us! He was very thorough with everything he showed us and gave us great tips on things we could do to improve things around the house that would actually help save on heating costs and such. I would recommend Donn to anyone!!! !